A bit of breeze is all these birds need to burst into song. Six brightly colored songbirds in flight are artfully suspended from a spring green base to achieve the most melodious chimes. 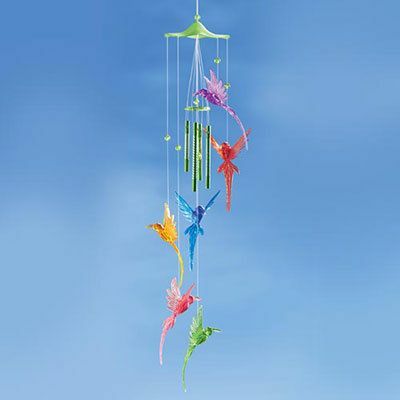 Hang this Colorful Songbird Wind Chime from the eaves or on a shepherd's hook in the garden. Approx. 30"l.
The picture does NOT do this item justice. Yes-they are plastic, but they are gorgeous!!! The chimes themselves sound so pretty. If you have a spot in your garden or by the house, I recommend this for you. You will not be sorry. And the price is amazing. I will be a customer for a long time! The customer service is great, and the prices are great on almost everything. With that combination you can't go wrong!!!!! !